+$ anything extra raised in sponsorships lowered our expenses and/or allowed us to raise the bar on demo day and happy hours. In 2014, we reached a pivotal position. We were ranked in the top 11, had 3 successful classes (funds), became a dominant source for energy and cleantech startups, developed the deepest bench of energy experts from around the world (scientists, engineers, entrepreneurs, executives, investors, policy experts), and built deep industry relationships amongst most of the critical customers across the industry value chain. But how will we continue to fund the operations after class 4? Option 1: Do we continue to raise annual accelerator funds from local angel investors and institutions? Option 2: Do we change our business model? Option 3: Do we raise a larger fund ($30M – $50M) to fund both the accelerator and make Seed and Series A investments? Option 1 was not on the table. As the founder and largest investor in all 3 funds, I promised my investors that after 5 years of running SURGE, I would not ask for more money until we had realized returns. Our unrealized returns are tracking towards a venture trajectory but as an investor with significant skin in the game, we have not returned cash. And we are all suffering from the J Curve! Option 2 is the best idea…but the lure of being a “venture capitalist” supposedly captured our hearts and minds. In reality, being a venture capitalist is only the fuel to give us the necessary “skin in the game” to work alongside inspirational entrepreneurs. The future of SURGE is taking Option 2 and I will explain why I chose to shut down option 3. For a more detailed explanation, you can read about the SURGE pause. Option 3 was a decision we made to (1) pay for the accelerator program (we planned to carve out $1M per year to run the accelerator from the larger fund), (2) invest into the winners coming out of our amazing alumni and future prospects, and (3) to set the baseline / benchmark (insert right descriptor here) for how to run a cleantech and energy tech Series Seed and Series A fund. For over a year, I lived and breathed venture capital fundraising road show and here is what I learned and how it has changed my perspective. My first order of business was due diligence reading about the process. My favorite book, The Business of Venture Capital by Mahendra Ramsinghani, was my main reference guide and the outline I follow below. My belief in SURGE, my role, and love for what we were doing took a significant change the moment I decided to raise a larger fund. I moved out of the Shack’s downstairs scrum and went to the ivory tower upstairs. I was the only team member isolated to focus 100% on raising a fund. This was my 1st “Precaucion”…Piso Mojado. I set the fund’s vision to become the best performing fund. I was told numerous times by institutions and others that the best fund managers have a stellar first time fund. I was not going to escalate my commitment to this without understanding the bar. With my experience in SURGE and after numerous meetings with institutional investors (discussed below), I believed that Cash on Cash Return was the best metric to measure and to plan for in our fund. (There is a longer discussion about how to “game the system” when investing (i.e. investing into a late stage deal for the quick hit) but we never got this far. Andreessen Horowitz’s first time fund which was marketed for early stage put money into Skype ($50M loan) and Fusion-io ($45M Series C) and was able to show a greater than 2X return. Again, Cash on Cash speaks louder than any other metric. I pulled data from a local institutional investor to look at actuals. For example, this report from 2011 shows UTIMCO’s private equity investments…SCF Partners (Houston’s icon and the best oilfield services investor) is the best performing fund manager when it comes to returning cash back to UTIMCO. And investors love to get paid. While Union Square is the best performing fund manager in regards to IRR (an academic metric), they have only returned 38% of the cash taken from UTIMCO while SCF Partners has returns almost 2X the cash. I preach and believe in Sandler. Sales is a function of quantity and correctly managing behaviors. I did eat my own dog food. I researched what it took other funds to raise their capital and put tother a funnel that we would measure and discuss weekly. I used Greycroft’s 2nd fund as the target metrics to measure against. Once I had the funnel strategy, I put together the SURGE funnel. At a high-level, investors would come from 5 key sources: Corporate Fund-of-Funds investors, Institutions (long-shot but worth exploring), Family Offices, High-Net-Worth Individuals, and Existing Investors. I distributed these investors by key geographic locations relevant to us to set realistic priorities: Houston (#1), Dallas / Ft. Worth (2nd largest energy town), Austin, Rest of Texas, and out of Texas (least likely investor due to our location and focus on energy). I then shifted to tactical and believed that it would take 30 initial contacts and 6 meetings per week at a minimum to make this work. Instead of measuring how much money was raised (which is a lagging indicator), I measured activity (# of contacts and meetings) on a daily and weekly basis. These were important Key Leading Indicators that will dictate our ultimate success. The focus and diligence on treating this like a hard-core sales strategy worked. We learned that the hardest investor is your first “anchor.” As Sandler teaches us, people buy for one of two reasons: to relieve pain or to gain pleasure. When you are raising money from investors, there is no pain nor pleasure. It might be the most difficult of all sales processes. I cranked up SalesforceIQ and reported to my team on a weekly basis regarding my “numbers.” This became a precaucion…I was the only one that had a real “#s” on which to report on. Being held accountable does not work when their is inequality in the system. Our team and my belief in them began to break down during this process. I tasked them to run our 4th program while I continued to keep my head down and sell, sell, sell. What was not fair (another precaucion) was tasking a team that had never worked with start-ups, to work with startups. Piso Mojado. For a fund less than $150M, the ideal “investor” will be High-Net-Worth Individuals, Family Offices, and Strategics (Customers that have Fund-of-Funds Strategies). While Pension Funds and Endowments makeup the majority of investors into funds, our target raise $30M – $50M was too small for them to waste their time. We were raising a venture capital fund. Venture Capital is a subset of “private equity” which is a small subset of a pension fund’s allocation. And most of these larger investors do not write checks less than $50M and cannot be more than ~10% – 15% of any fund. We were correct and made the right decision to focus on industry customers, “highnets”, and family offices that were either located in our region and/or had expertise/interest in energy. The only downside was that most energy investors and Texas based family offices are not “pro technology.” Our pitch was that we would change their minds and that now was never a better time. It worked. As an aside, large investors do not hang out on LinkedIn, prefer to run in tight circles, and are extremely difficult to find. While I have raised money, I never done it from the tight knit family offices and HiNet’s. Getting to them was a ground game of indentify, network, find best introduction, get a 1st meeting, etc… It took me 3 months to understand and define the investor ecosystem in Texas, primarily Houston. And I learned a valuable lesson: Who introduces you to a target investor is as important as your story itself. This process taught me another important lesson (Cuidado…Piso Mojado): your investors become your customer. Who was I serving? The entrepreneurs or the investors? Placement Agents are an important part of the fundraising and venture ecosystem. Their business model is simple. You pay them a % of the money that they help you raise. They give you advice and introduce you to their network. The best placement agents do not like working with first time funds nor small funds…because they do not make enough money and it takes just as long if not longer to raise $30M as $300M. We considered hiring a few placement agents and came to the conclusion that we could not afford the economics. For the past 4 years, I did not take a salary. If we hired a placement agent, our annual management fee (in our case, it would be about $1.1M per year for the first 3 years. And this “budget” included the entire team, rent, etc…) would be reduced significantly…and my “salary” would go back to almost nothing. Piso Mojado: by raising a $30M fund, I would basically work in SURGE for 10 years without ever making any money (realizing that our portfolio, while tracking well, was not going to exit anytime soon). I never started SURGE to make a large salary, but when you work for free, people take you for granted. Add we did the math…here is our analysis on what our fee would do if we brought in a placement agent…Piso Mojado and frustrated incorporated. In our discussions with placement agents, we became torn by scope creep: If it is as easy to raise $130M as $30M, and it opens up larger investors (institutions and endowments), why not raise a $130M fund? At one point, we considered a $150M fund…but the problem is this and a key learning: we HAD to make money on this fund. And the best fund managers have a great 1st fund. I was confident that we could easily put $30M to work, but I was not confident that we could invest $130M with our current and narrow investment thesis and inexperienced team. Piso Mojado: I started SURGE to go after disruptive, big, and clean ideas…the $30M fund was to chase small, capital efficient digital oilfield ideas. The first order of business in fund raising is to put together a pitch deck and critical due diligence. 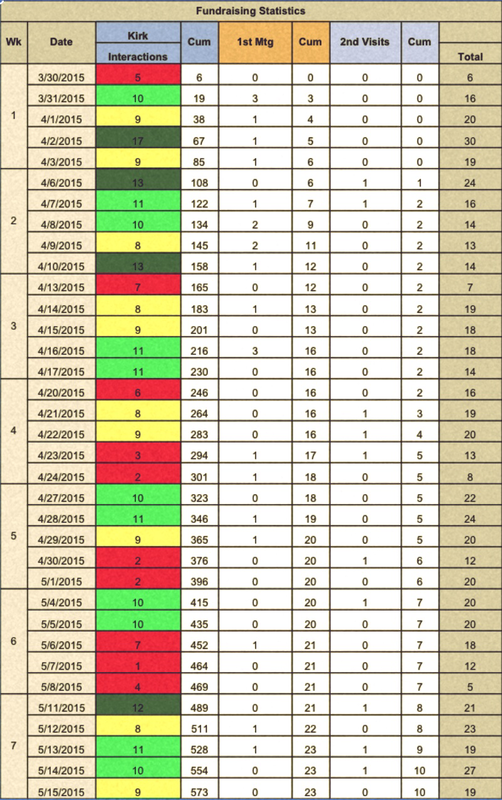 As we have done with all SURGE details, we were going to have the most organized and robust due diligence deck. The process of building these materials only made us sharper and more prepared. The debate was whether we needed a PPM (Private Placement Memorandum). This is basically a “business plan” for the fund. I wanted it to help us internally, but writing 50+ pages takes a while. Our advisors and fellow venture capitalist told us that we didn’t need it. We actually ended up writing one (I outsourced most of it to good friend, investor, and mentor). In hindsight, our advisors were right. We didn’t really need one. I am still extremely proud of our back office and systems that we put together to manage this fund. I believe that one of the reasons that we closed our first key anchor investor was due to our tight diligence. While the PPM is the long version of the “Pitch Deck”, the LPA (Limited Partnership Agreement) is the legal document “that contains legal terms that describe the control, management, financial investment, and distribution of returns.” In order to actually secure the capital, you need the LPA. People that read your due diligence also read the LPA line-by-line! This means that you need to get an attorney involved. Most of the language in an LPA is boiler plate from the attorney and your language from the PPM or a narrative of the pitch deck. One of my biggest mistakes was to allow my team and our attorneys to spend a lot of time on this document. We spent way too much money for such a small fund. I learned another painful lesson and Piso Mojado: when your team has no skin in the game, the costs really don’t get felt, so decisions to save money become less important. There is another important lesson here: my finance professor was right. You cannot finance long-term assets with short-term debt…wait, different lesson, Beware of the Beta: returns should be appropriately correlated with the risk. When there is no personal risk, the Beta does not care about the actual return and will be careless. What is the number one factor that an investor considers when investing into a first time fund? THE TEAM! Everyone that has worked for SURGE has been super impressive. Building a team to manage a fund is much different than building a “temporary” team that runs the operations of an accelerator. If you ask the top accelerators around the world, a majority of them have the same personnel predicament: you attract awesome people that come to take part and “give back” to the entrepreneur community, they get paid well below their “opportunity cost”, and there is no career path upward. So what happens? The leave after 2 years usually into a portfolio company, mentor led organization, or start a company. In our case, we needed to recruit a team that wanted to stay and build a legacy of funds. I knew that I had to build a team that would change the culture and dynamics of SURGE. My wife and I discussed this and went in with eyes wide open. The dramatic change in culture was precaucion to me but I was torn thinking that this was inevitable. I have read about this from others and have even been warned by famous executives that have been part of the largest corporate failures in history. Damn. I was completely wrong on this assumption. Piso Mojado Piso Mojado! Entrepreneurial Experience (I believe that Seed and Series A investors need to understand the plight of the entrepreneur. It’s cultural and matters). How many people in the world actually fit 3 of these things above let alone all 5? Piso Mojado, Piso Mojado, Piso Mojado…I should have read the tea leaves then. My pride pushed me forward. My heart was already lost. As I said before, everyone that has worked for SURGE has been quite impressive. But to change the world, we needed a miracle. And investors bet on teams that reduce risk. While we were successful convincing investors, I made assumptions that we would return 3x – 5x or more. And I just walked into a gun fight with toothpicks (and I am not a ninja). Piso Mojado. This tension internal to my soul was seen by my partners. They knew that I had doubts. However, it was never verbalized, as my team was motivated by this unrealized fund’s potential. This was my worst leadership and failure as a executive. We made it as far as getting close to a first close. It was during this period that this whole process became real. I wish that the warning signs playing out in my head and heart were voiced earlier to my wife and closest advisors. This was the final Peligro that had me pull the plug on this whole process. Somehow, through this entire process, my partners and I never formalized how much money we were going to put into the fund. Obvious Piso Mojado. Have you ever watched a buck chasing a doe during the rut? I have. They are blind to the obvious. We got this far in our fundraising process without anyone asking us how much we personally were going to invest. When we finally were pressed, all of the Piso Mojados added up into one kick in the face. It turned out that no one cared how much the team invested into the new fund (of which no one outside of myself was willing …precaucion), the investors ONLY cared about how much I was investing into the fund (another precaucion to me as to whom my partners were in context of what we were doing). At this point, the game was over! Before setting out to raise a fund, we studied and analyzed the market. Our good friend and investor, Kevin Lalande, at Santé Ventures wrote an excellent white paper explaining how best to design a fund size and why Venture Capital does not scale. Is there enough volume of exits over a 10 year period (which is the life of a typical VC fund)? What is the average deal size of the companies that are exiting? How much equity is required to finance these companies? To determine if our math made sense, we studied Energy Technology exits over there past 10 years. The Cleantech data is out there…but not the whole picture of energy technology overall. We instead studied software and other technology exits that were linked to energy including cleantech. The problem is that there is no Crunchbase for most of these deals. We had to beg, borrow, and steal quantitative data from the energy investment banks, technology banks, private equity firms, and others. 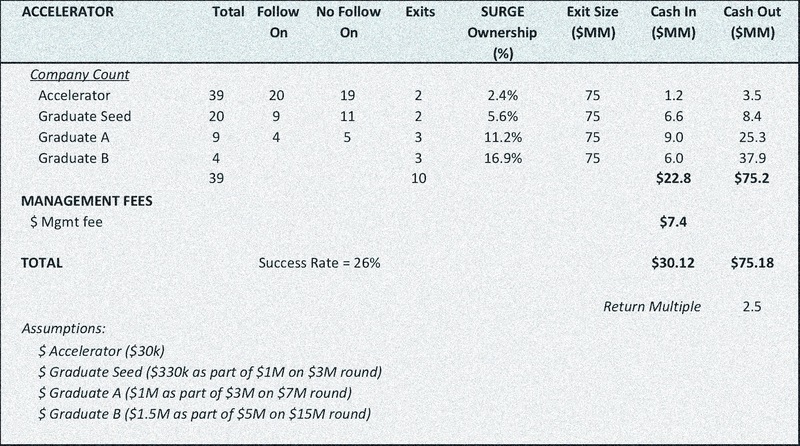 Volume of Exits: We counted enough companies being acquired for our $30M fund that would allow us to comfortably invest into a small percentage of the winners (knowing that we would be adding more through our work at SURGE Accelerator). While not stated in Santès analysis, I am a firm believer that quantity is the first rule of quality. Another rule of thumb is that a typical VC will invest into 1% of the deals that they review. This is one of the reasons why venture capital does not scale. The same logic applies at the exit. There must be enough exits in the ecosystem for one venture capitalist to pick a small subset of winners. Average Deal Size of Exits: In our case, we found that the average exit size for our focus, Energy Technology with an emphasis on software, was ~ $160M. This meant that we only needed 4 winners to make our model work if we held onto 15% equity in each. And we were taking 39 bets which would only pad our numbers. I believe in the Moneyball concept for venture capital as marketed by 500 Startups. I have attached two charts showing our math and methodology. Equity Ownership at Exit: Could we hold onto enough equity in order to make the math work above? According to our analysis (which included the 43 deals that we made in SURGE), we believed that it was reasonable to hold onto enough equity (15% was our target). Sourcing: One of SURGE’s most valuable benefits is our deal flow. We believe after comparing our quantity and quality of deals to corporate venture, other leading accelerators, and key databases that we see more and better entrepreneurs in energy technology than anyone else. That is one of the reasons why we wanted to fund the accelerator out of the fund itself. Due Diligence: We have already built a bench of 200+ experts (many of them world-leaders in their scientific and engineering craft) plus a consortium of energy companies that help us do both technical and market due diligence. The accelerator model is a brilliant way to de-risk. Fund Economics: The business model of the fund was the same as the generations old model of “2 & 20” (we charge a 2% annual management fee on the size of the fund to pay our expenses and get 20% carry). And the management fee of 2% kept us hungry since this was just a $30M fund. Portfolio investment strategy: A general rule of thumb is to reserve 10% of the fund for each individual portfolio company. In our case, we modeled investing into 39 companies…seems like a lot…but here is the logic: 39 of the companies are 4 years of accelerator classes. Out of this pool and other deals that we see, we would make 20 seed level investments. But like many funds, our Series A investments would be about 10 (9 in the model) with half going into the B Round. We planned to stop there. This allowed a team of two GP’s to sit on 5 boards. There were many things about the process that made me proud. One these moments is that in all of the due diligence, SURGE’s reputation and hard work passed with flying colors. And after pulling the plug, a few important institutional investors called me and told me that I won their confidence and should give them a call when ready. I have never been more relieved. I am not afraid of managing a large fund. On the contrary, I believe the opportunity has never been better…but I am saving my ammunition for Houston’s Race for the Sun. We are going big and it is focused on changing energy, not living within it. Great news Kirk… thanks to be brave and keep entrepreneur spirit alive.. Thank you Juan…keep your head down. How’s the project coming? We keep moving. Now with enough money to keep the team alive for the next 8 months and some demos arranged in Uruguay, Ecuador, and Colombia we will be ready to start our journey to US and Europe. New opportunities on the IIoT (Industrial IoT) field looks to be addressable with our approach to the problem of complex network for utilities and industry in general. This will opening a new market where there are more understanding and opportunities. Kirk, great article. appreciated the honesty in sharing the struggles of your journey and the decision process you went through. It’s a great resource. Great post Kirk. And I love the transparency you reveal big time 🙂 But of the four segments of the global Oil & Gas industry, it seems like you were mostly upstream focused (1/4 of the industry). Right now upstream and the service companies that touch upstream are hurting in this low crude price market. But downstream is on fire. XOM international downstream earnings grew over 100% yr/yr. Thats crazy growth! I’m curious on how you are positioning your exits over the next 10 year period in this new hydrocarbon abundant world? Tons of deals being done every day in that space, but only if you understand the business. Regardless keep up the great work! Thank you for the comment…we invest across the entire energy value chain from production (incl O+G to Electricity) to consumption. We have companies focused on Upstream, Midstream, Downstream, Electricity Production, Transmission, and Delivery…but we have skewed too far in upstream…thus the current pivot. I think the real race for Houston and the industry is for the Sun…to own the sustainable production and consumption of all energy (see my post on this). The issue with downstream and our old model is finding capital efficient investments. We are changing our model… As a long focused investor, the growth of downstream sales of products which contributed to XOM’s growth is due to them not passing along savings to consumers as their input commodity costs dropped significantly. This industry is notorious for “profit taking” since there is no downside. This industry will change and not be as drastic from guard rail to guard rail as technology improves the transparency. XOM did not benefit due to amazing technological nor strategic moves but rather leveraged a massive change in commodity prices and failed to pass those changes to its customers. While consumers cannot impact this today, this will ultimately get fixed as we have seen this in every other commodity driven industry. Excellent post Kirk, I can’t thank you enough for all the words/advice/wisdom you’ve shared in this one as well many of your other articles and posts. I’m traveling the VC gauntlet now trying to raise capital with a midstream start-up and to use challenging as a descriptor is a weak choice. Anyway, my best you and may your surfing venture be pushed by huge and long lasting waves. @Kirk, thanks for the insight and transparency. As a follow-up, you might also encourage some of your beneficiaries to write their story of how they were able to raise fund from SURGE, considering the stiff competition. @Daymon LaPoint, without necessarily disclosing your start-up details, would you like to share your VC challenges here or privately (713-8996947). I’m on the road too (either ahead or behind you) and I believe we could learn one or two things from each other as we sojourn. SURGE is not “CLOSED” since there are over 100 awesome entrepreneurs out there still innovating as a SURGE portfolio company or working on a new idea to transform how we view, produce, and consumer energy.